Lush blouse, Banana Republic tank, Forever 21 belt and skirt, Calvin Klein flats. There is something so wonderfully whimsical and relaxing when you find an item that fully exemplifies who you are. It could be a piece of furniture, a table cloth, a dress... For me, it's a blouse. When I first saw this Lush blouse, it was love at first sight. The scooped neckline, billowing sleeves, over all sheerness and fishtail hem, all had me at hello. Of course I have it tucked into a skirt, so you can't get the full effect. You know how that goes. The skirt and the belt are both from Forever 21. Do you remember back in the early 2000's when Forever 21 was only made up of cheap polyester skanky dresses and everything in the store was pink, black and tan? They have come a long way since then: now they carry Miu Miu inspired prints. I have been pairing this belt with almost everything in my closet: I'm pleasantly surprised that 90% of the time, it works! A major bonus? It cost me $1.50. The skirt I got for less than $9. My accessories. I count lip color as an accessory. The lip shade above is as intense as the belt! 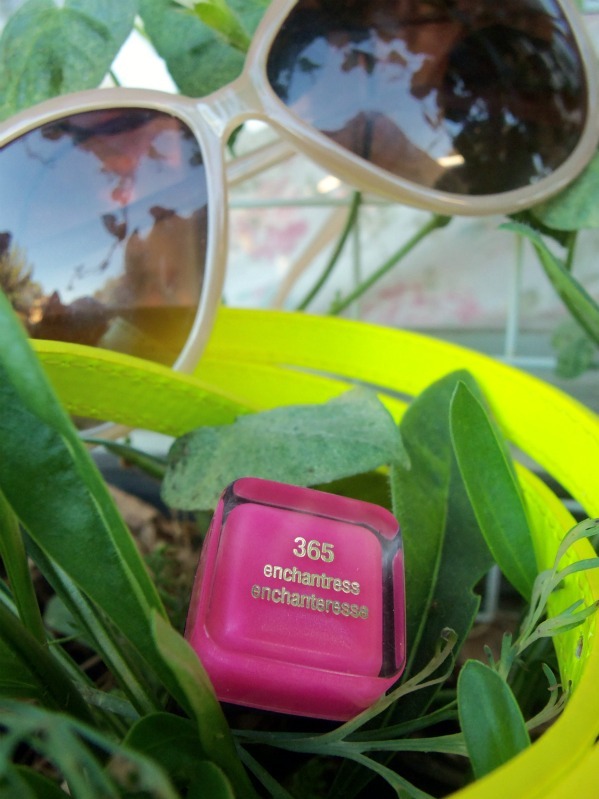 I like the little play on words: (I'm an) Enchantress 365 (days a year). That belt is such a nice funky touch to the outfit! $200 jewelry giveaway at my blog! love that neon yellow belt ! fun touch ! have you seen my new post ? Love the bright neon belt with the outfit!!! You look AWESOME!!! loove loove loove this outfit! The print of the skirt is perfect and neon belt just tops it off! Great job!! This outfit is beautiful, I love the blouse and the skirt has a gorgeous shape! I like you paired it together with a neon belt, and yes there are pieces that just speak to you! It's just "amber," and this is one of them! Great look! I love it!! I love how you paired that wonderful shirt with the neon belt! Such a great detail to pump up an outfit! I love that blouse. And you dressed it up perfectly with the skirt and belt! Following you now on Bloglovin and Google, I would love it if you followed me back! Love the lip color on you and the pop of yellow! I won't shop at forever 21 because of ethical reasons but they do have cute stuff! I love finding that special piece and this blouse is so perfectly you! You look lovely as always!